The AIGA has launched a campaign that looks to double the number of women in design leadership roles in the US, with plans to expand the initiative globally. The Double or Nothing campaign is part of the American Institute for Graphic Arts (AIGA)’s Women Lead Initiative, which looks to celebrate women in design and encourage their career progression. 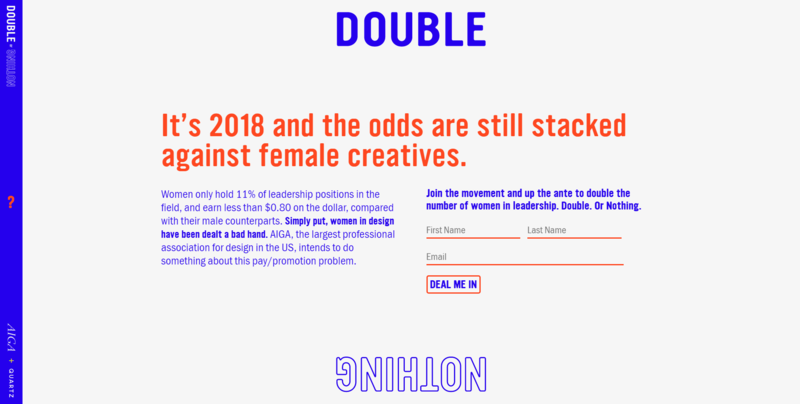 The campaign has been backed by global design consultancies including Pentagram, Lippincott, IBM and Blue State Digital, and looks to tackle the fact that only 11% of design leadership roles in the US are held by women, with the AIGA citing “promotion, pay and retention” as limiting issues for female designers. A brand identity and website for Double or Nothing has now launched, designed by Pentagram partner Emily Oberman. The identity features a blue and white colour palette, with the campaign name set in an all-caps, sans-serif typeface, alternating between filled-in text and text with an outline, as well as regular text and mirrored, upside-down text. The website also takes on this style, alongside yellow and orange drop shadows appearing when users hover their cursor over menu options. The website is relatively bare, prompting users to answer a question when they land on the homepage about the number of female design leaders. The site then encourages them to submit their details to join the campaign and pledge support. 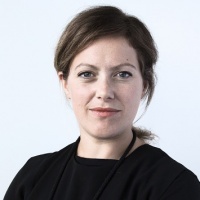 The campaign is looking to recruit more and more individuals and companies through its website, with the aim of eventually drawing up a list of design businesses that have pledged to work towards “inclusivity and balance”, says Oberman. IBM, a partner on the initiative, will eventually develop a set of written commitments and best practices for design companies to adopt, which aim to speed up career progression for female designers. While the initiative has been founded by a US organisation, the global design consultancies involved such as Pentagram and Lippincott aim to use the best practice guidelines in their UK offices and other international locations. 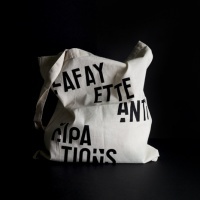 AIGA aims for the campaign to expand globally in the future. For more information, head to the Double or Nothing site, or follow the organisation on Twitter with #AIGAwomenlead and #DoubleOrNothingAiga. To inquire about how your business can get involved, contact genderequity@aiga.org.